This issue’s cover illustration by Ralph Steadman is from Garibaldi’s Biscuits published this month by Andersen Press (978 1 84270 860 6, £10.99 hbk). Ralph Steadman is interviewed by Martin Salisbury. Thanks to Andersen Press for their help with this November cover. 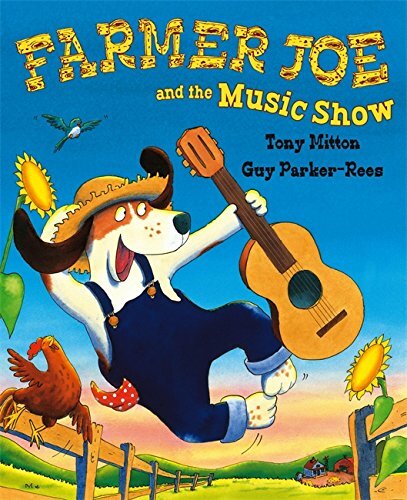 Farmer Joe is a dog whose farm is failing on all fronts. In desperation he gets his guitar and starts strumming. Things improve instantly, the more so when he’s joined by a fiddling fox, concertina-playing rabbit and bassist bear, and all is right ever after. Appropriately the simple tale is expressed in exuberant doggerel and its equivalent in crass caricature of animals and instruments. This slight offering could be validated by the inclusion of a tune to which to sing the ‘lyrics’ – but there’s nothing here. So Farmer Joe is no Bonzo Dog and his farm is no Jollity.